The different "pillars of gameplay", as called by the developers, are "Combat", "Stealth", "Hacking", and "Social". Players can switch between these gameplay types whenever they please, and certain pillars may flow into others. For example, a failed hack may sound an alarm and start a fight, and social skills might lead to the player gaining access to certain areas more easily than otherwise possible (thus avoiding the need for stealth). In the series, Augmentations are technological modifications to the human body that grant the user superhuman abilities. While augmentations in the first two games were based on nanotechnology,Human Revolution instead features mechanical augmentations as it precedes the first games chronologically. As players progress through the game, they can activate augmentations catering to each of the four gameplay types. 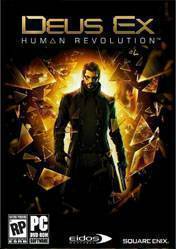 You're Adam Jensen, a worker in a modern technology company when one day certain things tend to feel off. You will become a powerful cyborg inside a great rpg-like feat unlocking system which determs your play style. Amazing cyber-punk rpg with an interesting story, good character progression, different ways and resulting optional approaches and just epic level design. Also decent graphics. This is a gream game ! I like it ! Un excellent jeu de pure Sci-Fi ! RPG FPS réussit !